Holy Terrors STARS Program - Letter from Cyndi Hinchey with attached Request for Donations. Allow me to introduce myself, my name is Cyndi Hinchey. I am Founder and Director of the Holy Terrors STARS. We are a non Profit (id # 232651702) sports/activity program for children with special needs. We provide free activities, snacks and drinks for our STARS children; we do this because our families already have the extra expenses that come with having a child with special needs. STARS provide the kids with fun activities and games (designed for their special needs) that typical kids have, but without having another expense added to an already overburdened family budget. In order to provide these services we rely heavily on fundraisers and the generosity and caring of people and businesses like yours. • Sponsoring a lane: $70 per lane. There are 36 lanes that are in need of sponsoring. All that sponsor a lane will have a sign over the lane or lanes sponsored as well as advertised on a handout that we give to all our guests the night of the event. 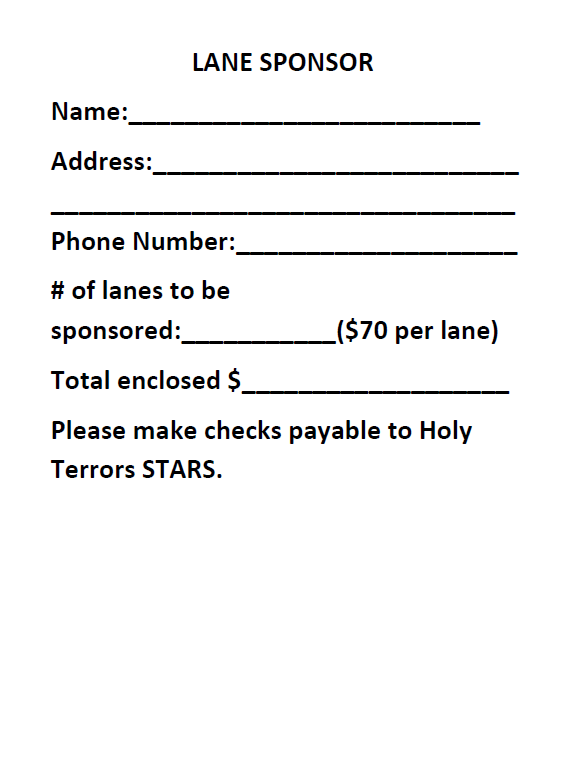 If you are interested in sponsoring a lane please fill out the attached lane sponsor sheet and send it back with a check or money order payable to Holy Terrors STARS. I would like to take this time to thank you for your time and consideration and if there is anything you would be able to help us out with I would GREATLY APPRECIATE it! 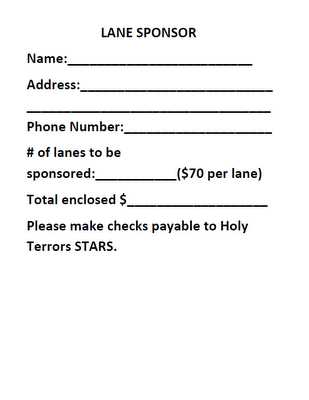 Enclosed you will find a lane sponsor sheet as well as a copy of our flyer. We are fast approaching our first birthday of our new playground on Saturday, October 27th. We are currently in the brainstorming stages and we would love for your help. 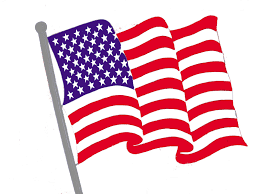 We will have a meeting on Thursday, September 13th at 5:30 pm at the Perzel Community Center next to Mayfair School. This is what we are thinking so far for our celebration: Fall/Halloween Theme. Invite children to wear costumes and trick or treat through the playground and in the parking lot behind. (it will be closed from cars) We need more ideas....games and activities for the children to do. We are hoping local businesses and organizations will like to participate, share their own information but must have candy to give out to the kids. We hope you can join us on the 13th to plan for our celebration. Please let me know if you can make it. If you cannot but still want to help we would love to have you. Please feel free to pass on this email to anyone who might be interested in helping us celebrate our beloved playground that we have built together for our children and our community. We ask that the Zoning Board of Adjustment grant a CONTINUANCE for this Case, and allow the Neighbors, the Mayfair Civic Association, and the Mayfair Business Association to meet with the Applicant/Owner to discuss their Proposed Certificate. The Same Property was listed as the Proposer for One (1) Use Variance, and Three (3) Certificates over Two (2) Years ago. 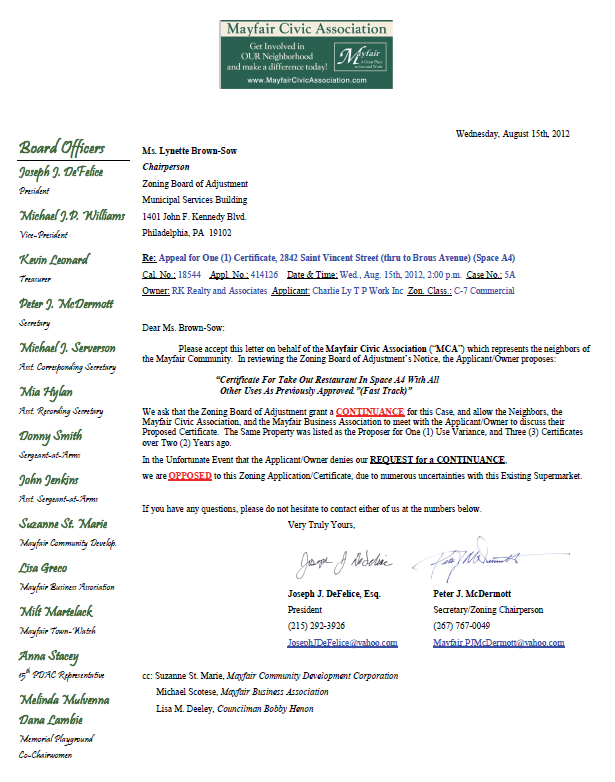 we are OPPOSED to this Zoning Application/Certificate, due to numerous uncertainties with this Existing Supermarket. 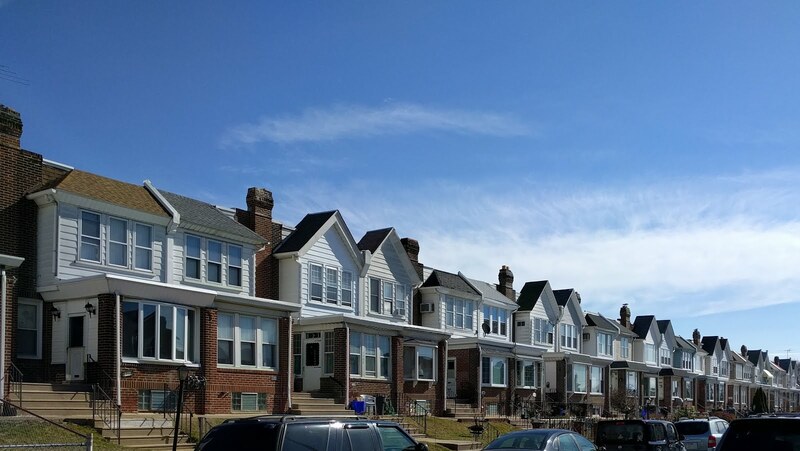 The Philadelphia City Planning Commission has received your application to become a Registered Community Organization (RCO). We are pleased to inform you that your application is approved. Your organization will be listed as a Local RCO. Your RCO's boundaries and contact information will be shown both on a map and list that will appear on a public website created by the City. The City Planning Commission website will link to the RCO list. In addition, the City's zoning map will include this information. The website will be operational by August 22nd when RCOs officially take effect with the new zoning code. In order to retain RCO status, organizations will need to submit a renewal application each year in June. PCPC will send you a renewal application several weeks in advance of the renewal period. There is no cost to renew your RCO status. Please feel free to contact us with any questions. You can contact your community planner or myself (see my contact information below). Thank you for participating in the new RCO program. We ask that the Zoning Board of Adjustment (ZBA) DENY this Use Variance. 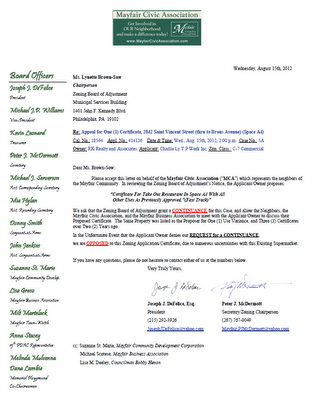 Unanimously, all of the Neighbors and the Mayfair Civic Association voted to OPPOSE this Application. Neighbors also circulate a Petition for Signatures of those Opposed to this Use Variance. This property is already a Duplex, exceeding its planned zoning of R-9A. Most of our neighborhood was re-zoned from R-9 Residential to R-9A Residential, to reduce density, and promote Single Family Residency. This property, 3359 Brighton, was included in that re-zoning. If you are available and interested, Friends of MMP are doing a fundraiser on Tuesday, August 14th at the Rita's Water Ice at Frankford and Cottman Ave (7239 Frankford Ave). Any and all help or support would be appreciated!! We'll be serving water ice from 6pm to 10pm and a percentage of the proceeds raised goes directly to the playground. Hope to see you there! Case is scheduled for Tuesday, August 14th, 2012, 9:30 a.m.
"Takeout Restaurant with Seating on the First (1st) Floor in the Same Building with an Existing Two (2) Family Dwelling Above." Case is scheduled for Tuesday, September 4th, 2012, 9:30 a.m.
"For the Creation of Self-Contained Music, D.J. Music/Live Entertainment with Dancing by Patrons (not as defined in Section 14-1605), as Part of an Existing Restaurant at First (1st) Floor in the Same Building as Four (4) Existing Apartments at Second (2nd) Floor as previously approved, Size and Location as shown in Application." Case is scheduled for Tuesday, September 25th, 2012, 9:30 a.m. It is rather unfortunate that someone would enter onto the property of another and vandalize their property. We do not condone this type of behavior either as an act of intimidation or as an act of senseless vandalism. The Mayfair Town Watch will be in the area and are cognizant of the issue. We ask any neighbor that sees suspicious activity to, not approach the individual but rather, immediately contact the 15th Police District. Nevertheless, if you, as a neighborhood resident, feel that your best option for beating the heat in the summertime is a pool on your front lawn, we ask that you do so responsibly and follow all City Rules and regulations. In response to numerous complaints our organization has received throughout the summer, we had posted some regulations with respect to pools on your front lawn.